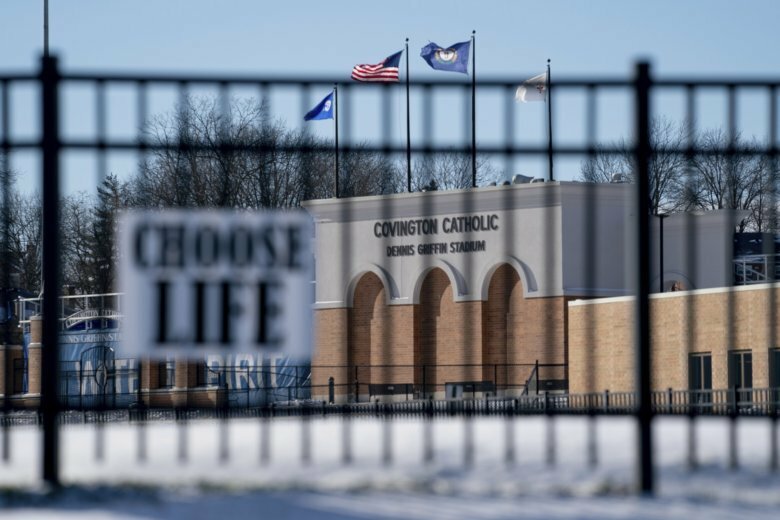 COVINGTON, Ky. (AP) — A Kentucky boys’ school shut down its campus Tuesday as a precaution and a small protest was held outside their diocese as fallout continued over an encounter involving white teenagers, Native American marchers and a black religious sect outside the Lincoln Memorial last week. The recorded images that initially generated outrage on social media were tightly focused on the students wearing “Make America Great Again” hats, who seemed to laugh derisively as they surrounded an elderly Native American beating a drum. “We’ve reached out and voiced our support,” Sanders said. She added that no one understands better than Trump when the media jumps to conclusions and “attacks you for something you may or may not have done.” And if the president does invite the students from Covington Catholic High School to the White House, Sanders said, it will be sometime after the shutdown has concluded. “We just don’t know what the volatility of the situation is with these people that react and they don’t know the full story. And it’s very scary,” Jill Hamlin of Cincinnati, a chaperone for the boys as they attended an anti-abortion rally, told FOX News on Tuesday morning. The diocese, which previously criticized the students’ behavior, promised to begin its investigation of events this week. Albert Running Wolf, a Native American from Fort Thomas, Kentucky, referred to Nathan Phillips during the event as “an honorable man” who was trying to be a peacemaker, but ended up being verbally attacked. He said Phillips deserves an apology. Kathleen Seither of Cold Spring, Kentucky, said she attended the rally in support of Native Americans, appalled by the students’ behavior. Among them was Cincinnati resident Maureen Green, a former Catholic and mother of three whose sign read: “I stand with the boys. Facts not fiction.” She said she thought the boys had been mispresented and “railroaded” by some media accounts. “I think these boys are learning a lot about how the world really works. It’s a life lesson,” she said. Meanwhile, the school’s principal, Robert Rowe, said school officials closed the campus as a safety precaution. Police cars blocked school entrances Tuesday afternoon. Phillips, for his part, offered to visit the boys’ campus for a dialogue on cultural appropriation, racism and the importance of listening to and respecting diverse cultures. Twitter, meanwhile, has suspended an account that helped the video go viral. Twitter prohibits the creation of “fake and misleading accounts,” and the encounter once again demonstrated the power of social media to not just amplify but manipulate narratives, aided by bots and malicious actors out to shape public discourse. A Twitter representative wrote in an email that “Deliberate attempts to manipulate the public conversation on Twitter by using misleading account information is a violation of the Twitter Rules.” It didn’t elaborate.